When you have a world with as many resources as we do, and as many creative thinkers as we do, you’re bound to have some wacky combinations. Over the years, we’ve seen steam-powered cars, liquid nitrogen-fueled cars, charcoal-powered cars, and even vehicles powered by ammonia. Solar technology seems like the most logical of the alternative-fuel lot, but given the resources required to make solar panels, and the wacky, unpractical configurations of the vehicles themselves, a mass-produced solar-powered car seems like it’s a world away. Well, thanks to a collaboration between the Eindhoven University of Technology and Dutch company NXP Semiconductors, a solar-powered car might be closer than once thought. Named Stella, the teardrop-shaped vehicle is the world’s first family vehicle to be powered completely by sunshine. Stella seats four and is completely energy positive, meaning that it produces twice as much energy as it consumes. The vehicle recently completed a zero-emissions jaunt through California, kicking off National Drive Electric Week in Los Angeles and traveling along the coast to Sacramento and San Francisco. Stella is capable of traveling up to 500 miles on a single charge. Stella isn’t all about alternative fuels, though; the vehicle is also a showcase toward the advancement of vehicle-to-vehicle (V2V) communication. A ‘connected car’ is able to exchange information with the vehicles ahead, allowing it to calibrate the most efficient driving speed for ideal traffic flow. These types of cars can also potentially communicate with city infrastructure, which could warn drivers of traffic jams and accidents before they become a part of them. 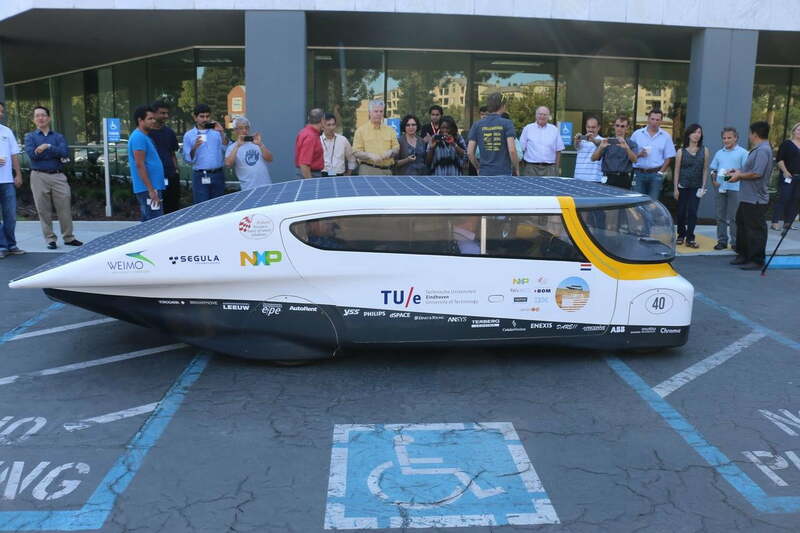 Relive Stella’s trip through The Golden State on Solar Team Eindhoven’s Facebook page.